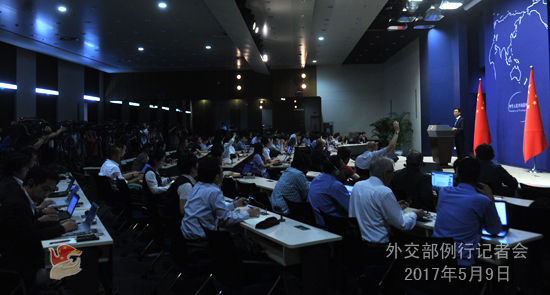 Q: The registration for the 70th World Health Assembly (WHA) has ended, yet Taiwan has not received any invitation. For many times it claimed that the mainland used health issues to "exert political pressure", and that the absence of Taiwan will "damage the well-being of the people in Taiwan" and "leave a loophole in the global epidemic prevention network". What is your comment on that? A: Yesterday the spokesperson from the Taiwan Affairs Office of the State Council has already expressed China's position. As we have stressed many times, the one-China principle must be followed when dealing with Taiwan's participation in activities held by international organizations. The World Health Organization (WHO) is a specialized agency of the United Nations. The UN General Assembly Resolution 2758 and WHA Resolution 25.1 provided legal grounds for dealing with the above-mentioned issue. When dealing with Taiwan's participation at the WHA, the WHO secretariat acts in strict accordance with UN General Assembly Resolution 2758 and WHA Resolution 25.1 as well as the one-China principle. Most countries around the world express understanding and support for China's stance on this issue. It has been proven that only by recognizing the one-China principle, can arrangements for Taiwan's participation be made through cross-Straits consultation. It is useless to court foreign support. I would like to stress that the central government of China has made proper arrangements for Taiwan's participation in global health affairs in line with the one-China principle. Within the framework of the International Health Regulations (2005), there are sound channels and mechanism for Taiwan to exchange information with the WHO and countries around the world. Experts from Taiwan can participate in WHO-related technical meetings while the WHO may also send experts to Taiwan for guidance when needed. These arrangements ensure timely and effective responses from Taiwan in case of public health emergencies either in Taiwan or in other places around the world. Claims that "people's right to health will be damaged" and "there will be a loophole in the global epidemic prevention network" are not true. Q: Today the Taiwan authorities say that the Taiwan "Health Minister" is going anyway to the WHA, and he is leading a delegation to Geneva. Has the Chinese government been in touch with the Swiss government to ask the government to deny their entry? A: I have just elaborated on China's position on Taiwan's participation at this year's WHA. I would like to stress that whatever measures the Democratic Progressive Party (DPP) authorities are going to take, they are doomed to fail. Q: There are reports of talks today between DPRK officials and former US officials in Norway. What are the purposes of the talks? What has been China's and Norway's role in facilitating the talks? 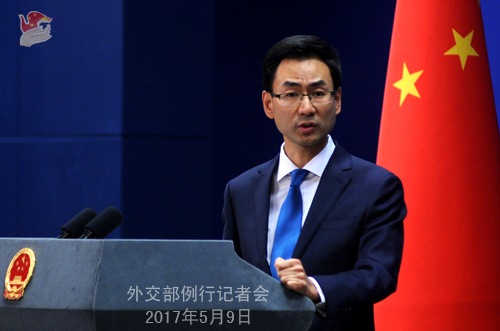 First, it has been China's position to peacefully resolve the nuclear issue of the Korean Peninsula through dialogue and consultation. Our position is consistent and known to all. It is the same stance that we have told the US, the DPRK and other relevant parties. Second, the situation of the Korean Peninsula is complex, sensitive and highly tense. China always maintains contact with relevant parties to ask them to stay cool minded and avoid any actions of provocation and irritation, so that the situation will not be escalated. 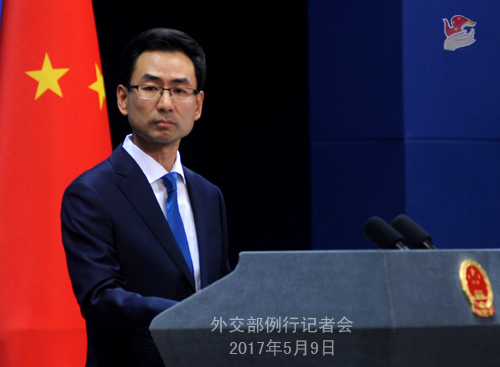 China also calls on and encourages various parties to resume dialogue and contact at an early date. 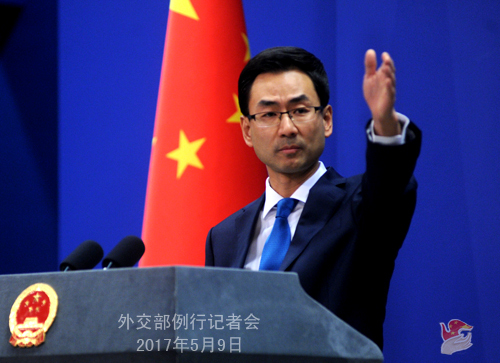 Third, China has noted the statement by the US side and its positive signal of peacefully resolving the nuclear issue of the Korean Peninsula through dialogue and consultation. We believe that relevant parties have also noticed the signal in a timely manner. Fourth, China will stay in touch with relevant parties and work to bring the nuclear issue of the Korean Peninsula back to the right track of peaceful settlement through dialogue and consultation. Q: Can you confirm that there are ongoing talks yesterday and today in Norway between DPRK officials and former US officials? Q: The ROK is having its presidential election today. Does the Chinese government hope that the new administration will stop the deployment of THAAD? A: China's position on the THAAD issue is clear, consistent and unchanged. Q: It has been previously reported that in 2015 China invited the DPRK to join the Belt and Road initiative. Is this true? Did the DPRK ever accept the invitation? A: As far as I know, the DPRK will send an official delegation to attend relevant activities of the Belt and Road Forum for International Cooperation. Q: Chinese Ambassador to India Mr. Luo Zhaohui, while addressing the United Service Institution last week in Delhi, has come up with some very significant proposals. He also came up with this idea of mediation in the conflict between India and Pakistan if both countries are willing. Can you elaborate on this? Secondly, while addressing the same institute, the Indian army chief has expressed concerns over the strengthened ties between China and Pakistan and suggested that India strengthen relations with Iran, Iraq and Afghanistan in order to deal with the emerging threat from China-Pakistan "military alliance". I would like to have your reaction of this. A: This is a long question. I think it has two aspects. One is about the China-Pakistan Economic Corridor (CPEC) and Ambassador Luo Zhaohui's remarks, and the other is about India's intention of strengthening cooperation with countries such as Iran. I will answer them one by one. For the CPEC, we have stressed many times that it is an economic cooperation initiative. China's active participation in and promotion of the CPEC does not mean that we change our position on the relevant issue. They are two different things. As we have emphasized time and again that the Kashmir issue is one left over from history between India and Pakistan. We hope both sides can properly address the issue through dialogue and consultation. As far as I know, the website of the Chinese Embassy in India has put out information about Ambassador Luo's relevant activity and speech in India. If you are interested, you can visit the Embassy's website for more information. I have no more information to offer. As for your second question, we welcome the growing bilateral relations and closer cooperation between India and relevant sides. We hope that the cooperation can contribute to mutual trust among regional countries and regional peace and stability. Q: India has not yet named its delegation to attend the Belt and Road forum. Are there any discussions going on between China and India after Ambassador Luo Zhaohui made the speech? How significant it is for China that India should attend this particular forum? A: As the opening ceremony draws near, more and more attention is being paid to the Belt and Road Forum for International Cooperation. As far as I know, there are Indian scholars applying for attending the high-level meetings during the forum. All the participants are our guests, and as the organizer and host, China will show our warm hospitality to them and all the other distinguished foreign guests. Q: Can you confirm that China did invite the DPRK to become one member of the Belt and Road initiative in 2015? There are some reports that the US citizen who was arrested in the DPRK on Sunday might actually also have a Chinese passport. Although I believe that China does not recognize joint nationality, I still want to ask whether he may also be entitled to Chinese consular protection. A: I will take your second question first. We have noted relevant reports. We hope relevant parties can properly handle the case. As for your first question, do you mean whether China invited the DPRK to join the Belt and Road initiative in 2015? Follow-up: Apparently China invited the DPRK in 2015, but it is not clear to me the DPRK ever actually formally responded to China. A: The DPRK side will send an official delegation to attend the Belt and Road Forum for International Cooperation. As we have stressed many times, the Belt and Road initiative is open to any country sharing a common goal. By enhancing complementarities between one's own development strategy and that of others, countries can benefit from this kind of international cooperation while contribute to regional and world economy. I do not think the Belt and Road initiative is membership-based. China holds an open attitude. Any country interested can join us as long as they share a common goal. Q: Did Pakistan take up with China Ambassador Luo Zhaohui's speech? A: I am not aware of that. As I said, you can find information about Ambassador Luo's activities and remarks on the Embassy's website. I have no more information to offer. Q: Can we assume that the ambassador is speaking for the Chinese government? A: As I said, the Embassy's website has put out relevant information about Ambassador Luo's activities and remarks. You can visit the website for more information. I have nothing more to offer. Q: The ambassador's speech in New Delhi actually gave us a five-point proposal on improving the bilateral ties between China and India. Would you say that it signals a kind of roadmap or framework in which we move forward given the present difficulties the relations encountered? A: I have no information about the details of Ambassador Luo's speech. You can visit the Embassy's website for the transcript. As for his opinions and suggestions on how to develop China-India relations, I want to point out that as the two largest developing countries in the world, closer bilateral relations and broader cooperation between China and India is in the interests of the two countries and two peoples, and can contribute to regional peace and stability and the unity among developing countries. Therefore, China's willingness to develop its relations with India is clear and unchanged. Q: In Pakistan, a number of much needed energy projects are being completed under China-Pakistan Economic Corridor, which is a flagship project of the Belt and Road initiative. Would you share with us the progress of the project which is very crucial to end the energy crisis in Pakistan? A: As far as I know, the construction of the CPEC is making steady progress and has entered a stage of comprehensive implementation. Both sides have planned 17 priority projects in the field of energy, 11 of which have started construction. Most of the projects will be completed by the end of 2019, which will significantly ease the energy shortage in Pakistan and deliver great benefits to the people. As for the details of the projects, if you are interested, you can ask relevant authorities for more information. Q: We noticed that China recently announced the early harvest of the Belt and Road initiative, which is remarkable and even better than our expectation. But we also noticed some media's opinion that there will be difficulties and challenges ahead and it will not be plain sailing for the initiative. What is China's comment on that? A: We have noted relevant opinions and appreciate the "caution" from the media. The Belt and Road initiative was born in the wake of the international financial crisis when the world economic recovery remains sluggish and countries face difficulties and challenges in their development. The initiative is to deal with these challenges by strengthening international cooperation and integrating resources, and help countries, especially developing countries in Asia and Europe, to solve problems in their development. Ever since the beginning, the Belt and Road initiative has received warm response from the international community and shown broad prospects. Like other great causes in the human history, it is inevitable for the initiative to encounter various kinds of difficulties and challenges. This is quite normal and has been expected. Challenges are to be solved and difficulties are to be conquered. This is the valuable experience we learned from nearly 40 years of reform and opening-up. During this weekend, visionary people from around the world will gather in Beijing for the Belt and Road Forum for International Cooperation. The purpose of the forum is to summarize experience, make general planning, analyze problems and forge synergy to jointly face challenges. We believe, with the concerted efforts of various parties, the forum will be a complete success, and the Belt and Road initiative will keep moving forward against all the challenges and difficulties.